What can you possibly do at 4am in London that doesn't involve sleeping, menial labour or puking into a gutter? Marsha Moore's new book offers six suggestions: queue for beigels on Brick Lane; tuck into German sausage at Kurz & Lang; clubbing at the O2; work on your pecs at Soho's all-night gym; all-Sunday partying at Flesh 24-hour Party; or watch the Westminster lights play out on the Thames form the Hungerford foot bridges. In other words, that's baps, sausage, gyrate, pump, gyrate, and relax. We like it. While this is yet another book to add to the already swollen alt.London bookshelf, the entries are arranged in a novel format, with the capital's manifold opportunities filed into hourly slots. It's a double-edged sword of a contrivance. On the one hand, this sectioning works as a handy reference for when best to visit London's attractions. For example, get ye to the the Guard's Museum between 10 and 11am to watch the Changing of the Guards from 'the other end', then pop over to St James's Park betwixt 2pm and 3pm to gawp at the pelicans being fed. But the format doesn't lend itself so well to the many attractions that have no real time sensitivity, which are inserted willy-nilly throughout the daylight hours. Nevertheless, there are some real treasures in here. Who knew you could take a balloon ride over St Paul's at 6am? And have you ever considered visiting the Gunnersbury Park Museum or enrolling in a shaving school? Moore crams in hundreds of ideas, many of them not to be found in similar guides. Entries are written in the enthusiastic, upbeat style of someone with the reserves of energy to have actually tried most of her own suggestions. Many would say 'pah' to the idea that London is a city that never sleeps. This new book stands as statement to the contrary. 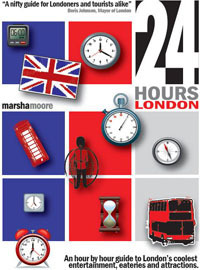 24 Hours London is available from 3 November from Prospera Publishing.